This recording brings together a young cast in a performance bristling with energy. The sound is overwhelming in its impact. The secret of the overwhelming success of Carl Orff’s Carmina Burana lies in its skillful and apparently simple mixture of archaic rhythms and sounds (derived from the composer’s convictions about what ancient music must have sounded like) with the sort of music that was actually performed at medieval mystery plays. Ive sung this live a few times and own several copies and felt this performance lacked energy and oomph. The sound quality was terrible too, the worst of my 100 or so DG recordings.I much prefer the runnicles on sacd, though it may be a bit OTT for some. 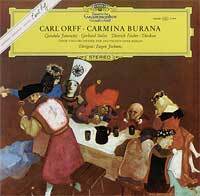 Excellent recording; probably the best of the whole Carmina Burana lot! To my ears, this recording has been the reference as to how Carmina Burana should sound. And that isn't accepting the fact that Carl Orff "authorized" this recording as stated on the cover. Everything: soloists, chorus, and orchestra perform with white heat under Jochum's baton, and DG has given this recording the best sound it was capable of at the time the recording was made (1967, I believe). The current reissue has a slight improvement in sound over the original DG issues.